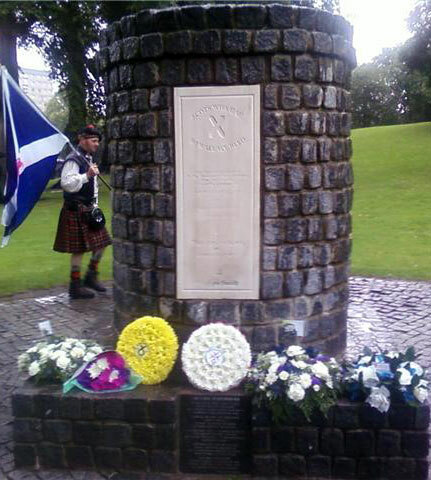 Despite the day starting off bright and sunny and the rain holding off for the march it became monsoon season by the time we reached the monument in Callander Park. 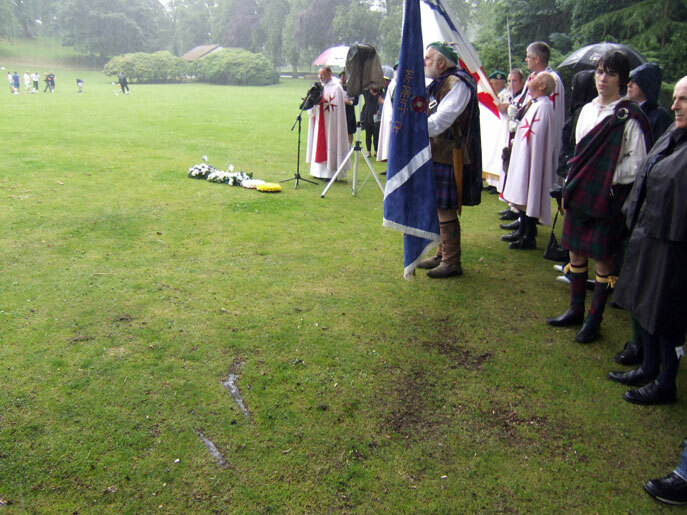 The proceeding started off at the Kirk where members of Crann Tara, Siol nan Gaidheal, The Society of William Wallace, The Strathleven Artisans, The Knights Templar, The Scottish National Party, Falkirk Historical Society and The Men of Bute all paid their respects to the brave souls buried there. 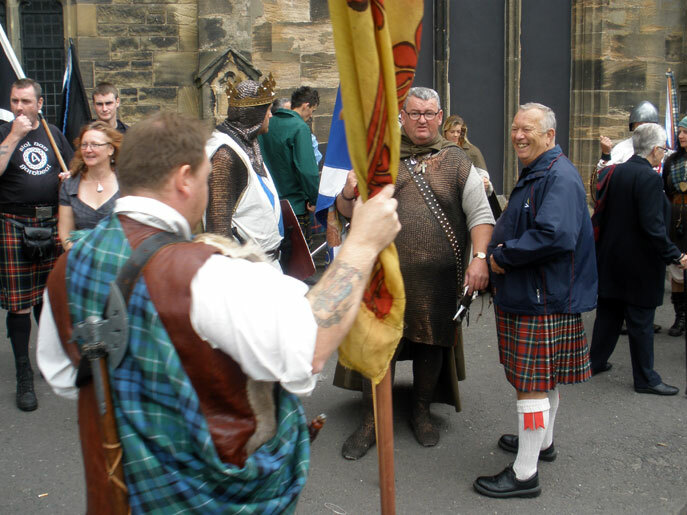 Then we marched through the town of Falkirk led by The Denny and Dunipace pipe band and society member Gordon Aitken. Once we reached the memorial cairn it became obvious that the rain wasn't going to go away. There were a few brave souls who hung on in the rain to observe the wreaths being laid but it was getting to the stage that it really wasn't a great idea to be out in this weather and the service was cut short once the wreath laying ceremony was completed. We sought refuge in the nearest building which was the Claddagh hotel and everyone did their best to dry off. 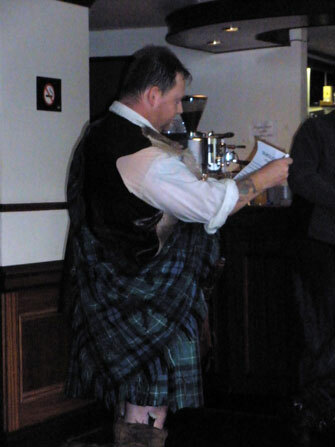 It was decided to have the speeches in the hotel seeing as we never got a chance at the monument. I started the proceedings and then Malcolm and Rab both gave fantastic heartfelt speeches that those who were there will remember for a long time. The assembled throng then went their separate ways and I and a few friends went and sampled the hospitality of some of Falkirk's drinking establishments until it was time for our evening get together at the Camelon Outdoor Bowling Club, as hosts go, they couldn't have done enough for us, all the staff were dressed in their finest highland attire and it all made us look forward to a great night of Scottish music and dance. 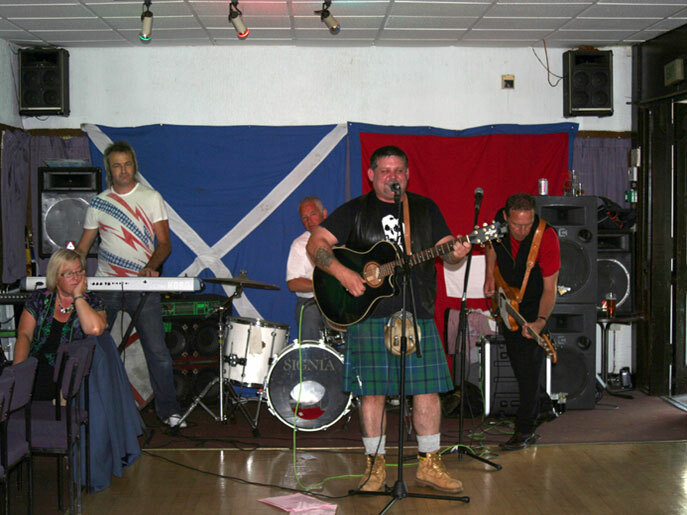 Fiery Jack were our first band to entertain us and I don't think I've seen them perform better, George seemed to be right in the mood and he put in several sets of fantastic music. We also had a couple of songs from Àdhamh and Daibhidh who sang some lovely traditional Gaelic music and some old favourites which went down an absolute storm. 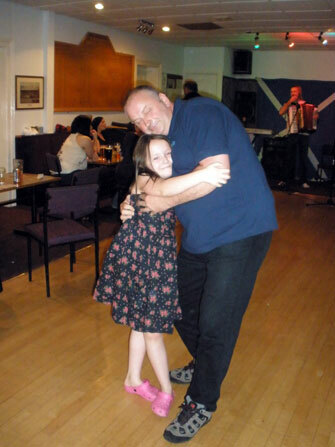 We also had the lovely Kate sing us a few songs and not to be outdone we had Gordon sing for us as well, the amount of talent on display was fantastic and we were entertained throughout the night. Myself and Rab got a chance to say our speeches once more and the assembled crowd seemed to approve so I think myself and Bob were happy chappies and the nerves disappeared once our turn was over. The claymore that has been used for the last three years at the commemoration was given to the bowling club in trust and the look on the Secretary's face was brilliant, a genuinely nice gesture that was greatly received by all. So many folk to thank, Grant and Gordon for getting it all together and for giving me the honour of saying a few words, special mention to Grant for giving me my first taste of Midori, thanks pal, to David, Duncan and Norrie for the photos, and to everyone we met in the park and at the hall, you all made it a great and worthy commemoration for the brave men who fought and died at Falkirk. Duncan looking rather splendid, waiting for the march to start. 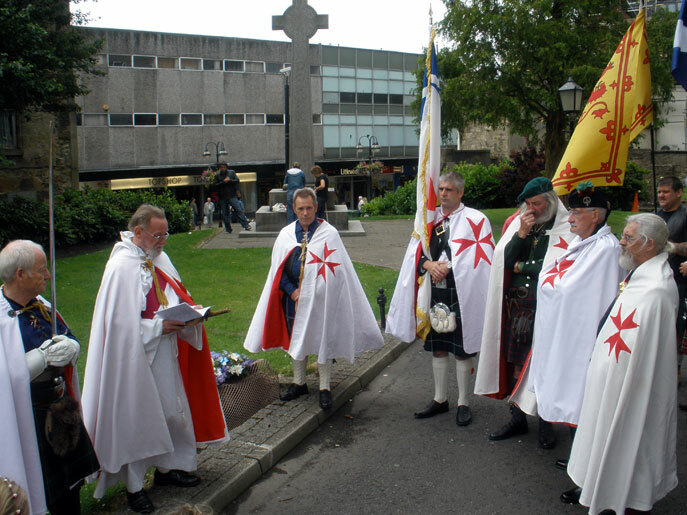 The Knights Templar say a few words at the Kirk for the men of Bute. 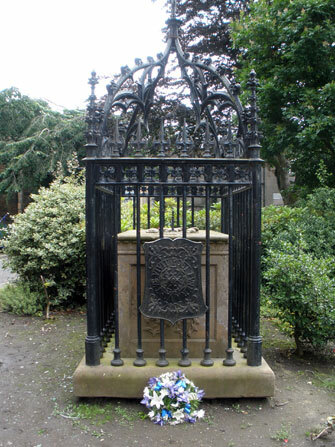 Wreath at Sir John de Graeme's tomb. Wreath at Sir John Stewart's tomb. 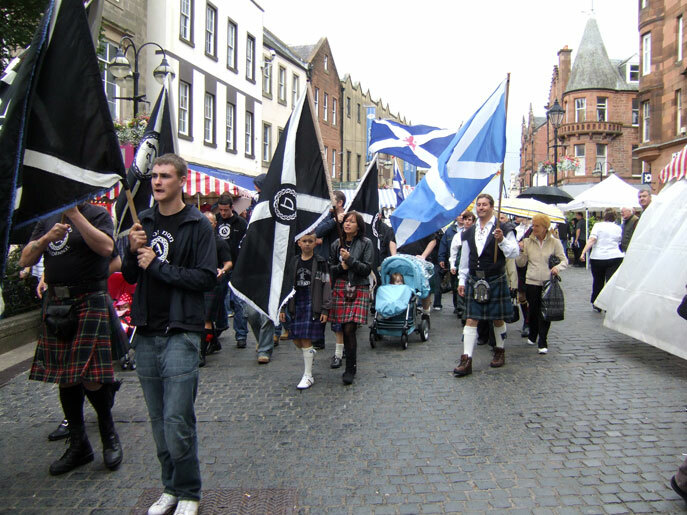 Marching through Falkirk town centre. 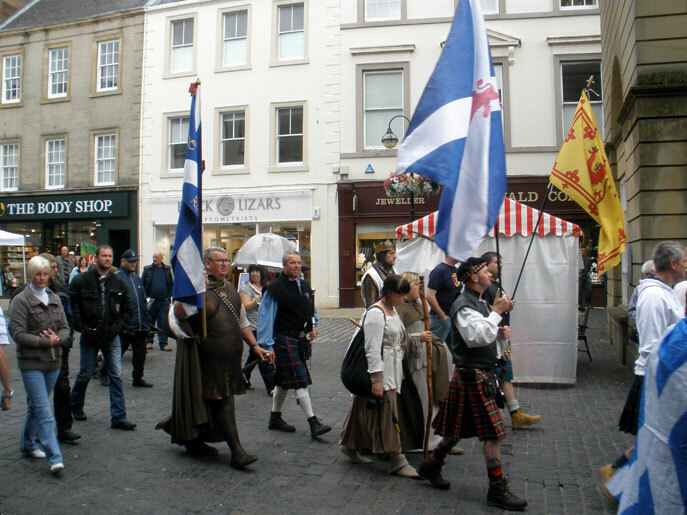 Great to see so many societies come together to honour the Battle of Falkirk. Great to see so many flags on show. 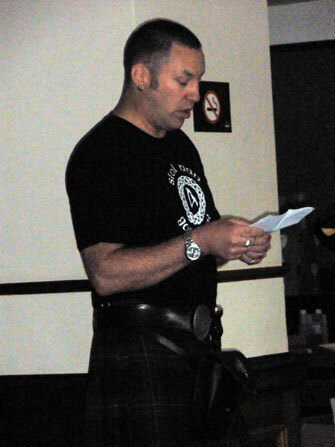 Rab says a few words at the hotel. 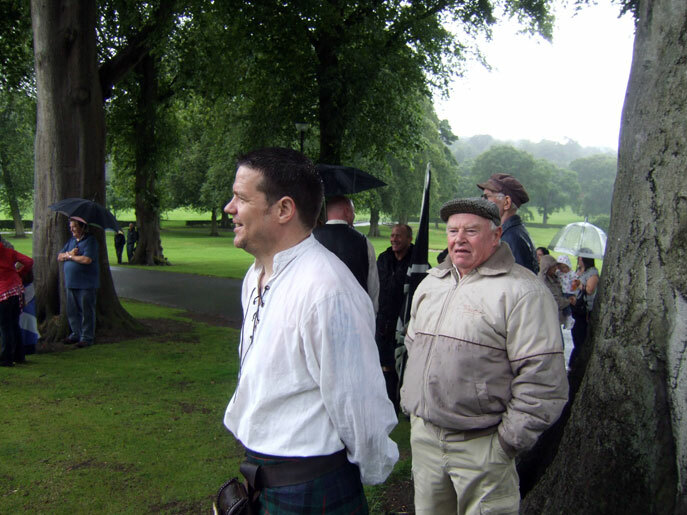 Malcolm tells us about the battle of Falkirk. 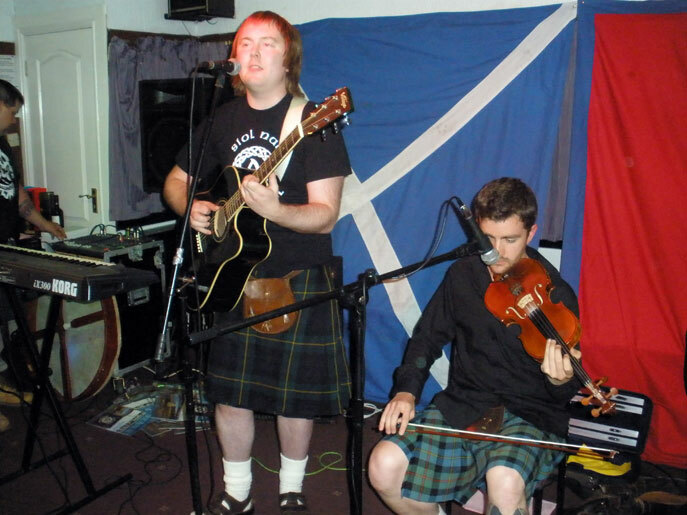 Àdhamh and Daibhidh give us some fine Gaelic music, really brought the house down. Fiery Jack were at their very best tonight Superb. Fran and Anna, our lovely barmaids for the evening. 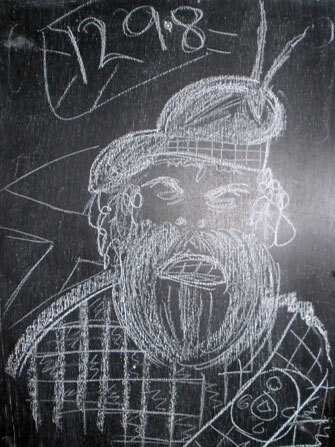 Nearly everyone in Scotland knows of William Wallace. Thanks to the movie Braveheart, Scotland’s favourite son is indeed world famous. But the man behind the Hollywood legend was already famous in Scotland. Victory at Stirling sealed William’s place in the hearts and minds of a nation. Defeat at Falkirk saw William resign the guardianship of Scotland and despite his credibility being damaged and his military reputation hindered; the Kingdom of Scotland was not conquered, thanks in large measure to Wallace’s scorched earth tactics. Despite King Edward's success at Falkirk, Wallace's campaign had so weakened the English army to the extent it was forced to abandon its carefully planned invasion of Scotland. Wallace and the brave men of Falkirk may indeed have lost the battle, waged here in 1298, but perhaps the events that took place that day took us a giant step closer to winning the war. William Wallace needs no tomb. 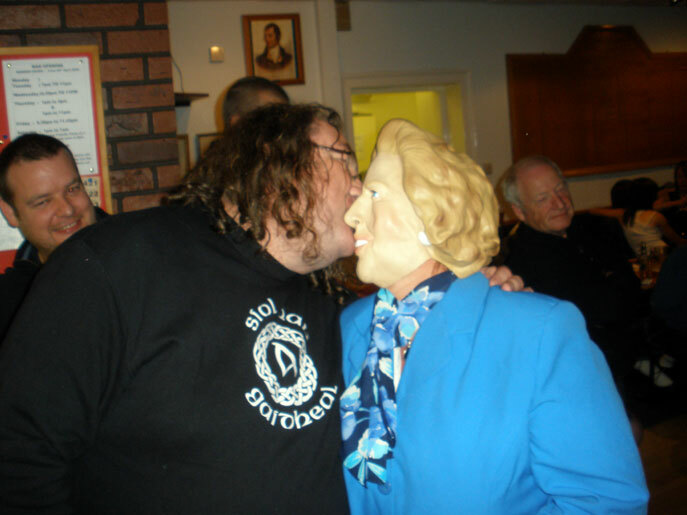 His memory lives on in the heart and souls of Scots. Every generation recognises his devotion to his native soil, and he will be remembered by Scotsmen and women till the end of time. But what of the brave men who fought alongside Wallace that day? It is said that Longshanks army numbered nearly 20,000 whereas the Scots numbered somewhere in the region of 12,000. Not exactly what you would call a fair fight. Despite the English advantage Wallace’s army stood firm and had some early success. That is until The English went to work with their deadly longbows. Their hail of deadly arrows attacked the schiltrons mercilessly. They were an easy target, with no defence and nowhere to hide. Unable to retreat or attack, the battle was lost for the Scots almost as soon as the first arrows began to fall. The exact number of dead isn’t known but the Scots fought long and hard before the day was lost, until finally they were forced to flee the field of battle and perhaps live to fight another day. Wallace asked his men a question before the battle; they answered it with honour and courage. They did indeed come to the ring and they most certainly danced their very best! That’s why we’re here today. To say thank you to those brave men who fought and died for Wallace and for Scotland, we should never forget that. Remember, they gave up their lives fighting for Scotland’s freedom, they weren’t fighting to increase Scotland’s empire, or for gold or for riches. They died defending their land from a foreign invader who wanted to take that land and enslave our people and destroy our very way of life! It would seem that they weren’t very successful, were they? Some folk will say, ach, it’s in the past, it was 700 years ago. Aye maybe, so should we forget the Holocaust, the First World War, the Second World War, 9/11? Of course we shouldn’t, but neither should we forget Scotland’s history. The battle of Falkirk may well have happened over 700 years ago but I believe that any man who fights and dies for Scotland should have the gratitude of the nation forever, no matter how long ago it happened. William Wallace and the men of Falkirk deserve to be remembered just as much as World War veterans in my eyes, and seeing so many of you here today, it would seem I’m not alone in thinking that thought. Scotland’s history should be vitally important to every one of us, how can we as a nation and a people really know who we are if we don’t know where we’ve come from? We now, at last, seem to have a government in charge that have finally put Scottish history into the curriculum, which will hopefully give the next generation a better understanding of Scotland’s rich and varied past. I myself wasn’t so lucky, from Primary to Secondary school I don’t recall any of my own country’s history being taught to me. We had stuff like the Russian Revolution, The First World War and a lot of British History which meant of course, a lot of English history. Don’t get me wrong, I have no objection to learning about these events, but not to the exclusion of my own country’s history. I would have loved to have learned about Scotland’s history at school, I might even have attended more classes than I actually did! I’ve lived in Paisley for almost thirty years and before anyone asks, no it wasn’t for anything I’d done wrong, it wasn’t some kind of penance I was doing. In Paisley I live less than 2 miles from the Wallace monument in Elderslie and I never knew it was there! I was born and raised in Glasgow less than 5 miles from the Wallace monument in Robroyston, and yes you’ve guessed it, I never knew it was there. 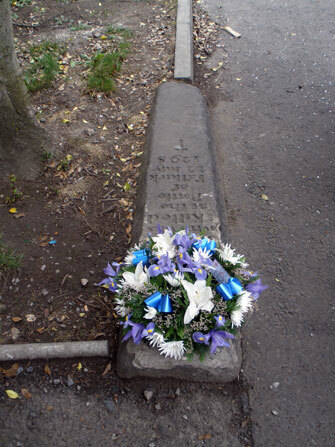 I used to stay less than a mile from Glasgow Cathedral where Bishop Robert Wishart, perhaps one of the greatest patriots Scotland has ever known, was laid to rest, and yes - you’ve guessed it, I never knew it was there. And yes, I'm talking about the actual Cathedral itself, never mind Bishop Wishart's tomb. That surely has to be wrong. But things are changing, the children of Scotland are learning about their history, they’re beginning to be told what’s out there; a whole generation of Scots are going to come through school with a better understanding of what being Scottish stands for, we should all encourage it and embrace it. Being a patriot doesn’t mean you have to be like Wallace or the men who died at Falkirk, being a patriot can be as simple as handing a child a book! Remember even the smallest pebble creates a ripple when you throw it into a pool. I’d like to finish with a wee poem written by Gordon Chisolm of Gaberlunzie which sums up perfectly how I feel about this land we all call home! It’s called Scotland Owns Me. Ladies and Gentleman, thank you for listening, ALBA GU BRATH! I was also asked if I'd like to say a few words at night in the hall, I tried to make this a wee bit more light-hearted. I can’t tell you how happy I am to be here tonight, surrounded by like minded people, patriots who care about their past as well as their futures. When I come to events like today’s commemoration it fills up the wee tartan tank inside me and enables me to deal with all the crap that life back home can fling at me. Some folk get it from golf, fishing or just being with their families. 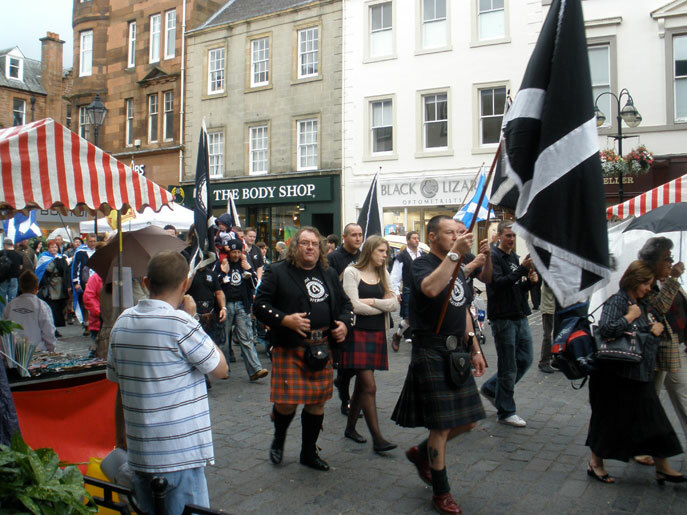 I get it from being at places like Falkirk today, I don’t mean I get my jollies by walking round war graves or anything like that, just being around good Scottish patriots is what I’m talking about, people who understand what I’m feeling, kinsmen, brothers, indeed Clansmen! 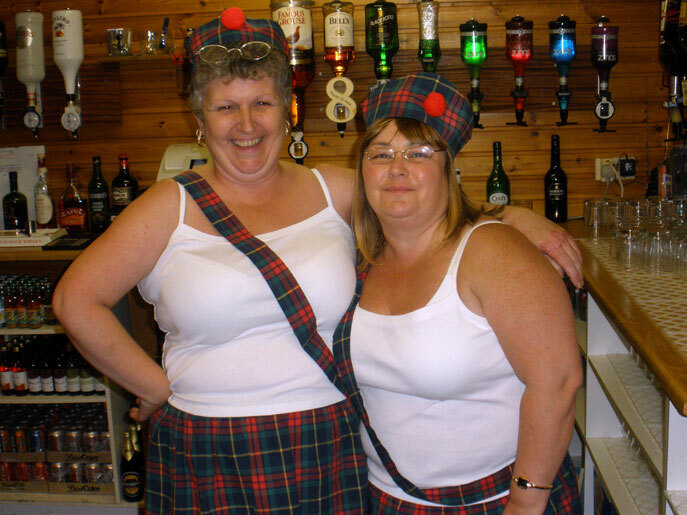 At days like today we get a chance to express our Scottishness and not feel ashamed or being told that we’re somehow being offensive to other people, most of these so called other people by the way are Scottish. Anyway, can you imagine what Scotland would be like if it was like this every day? Politicians would be reminded on a daily basis that they work for us, not for themselves. Children would be taught Gaelic at every school. 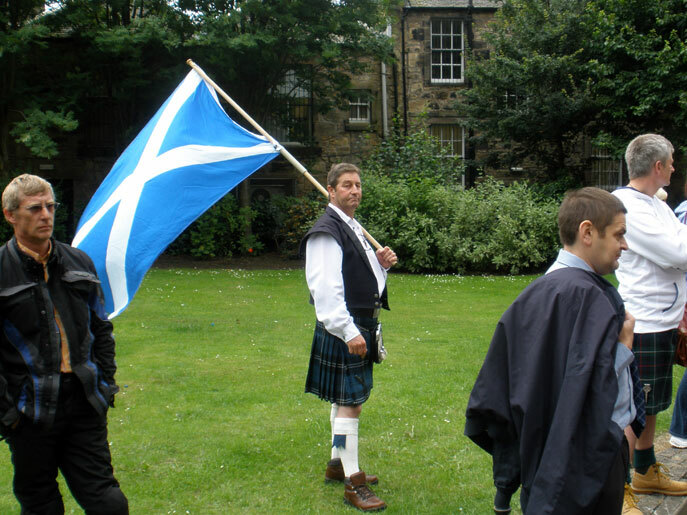 Saltires would be flown from all Government and official buildings. Whisky would be available on prescription! The Krankies would be made head of light entertainment at the BBC. 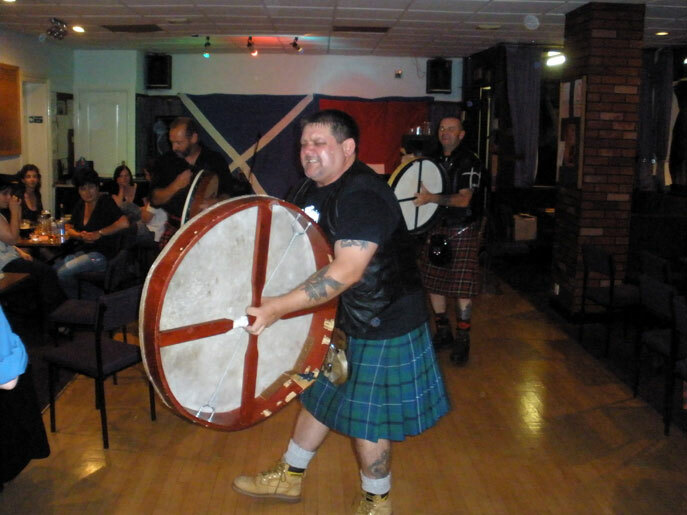 Andy Cameron’s We’re On The March Wae Ally’s Tartan Army would be played on the radio on the hour every hour! The World Cup would be held in Scotland every four years, just to make sure we qualify! Hadrian’s Wall would be rebuilt only it would be triple its original height. Foreign Nationals wishing to enter our country wouldn’t need to swear allegiance to Scotland, instead they would need to eat Haggis for a month, after we tell them what it’s made of - if they can do this, then they’re in! The wearing of the kilt will be mandatory every day except the Sabbath, on that day and only that day we can wear our joggies! People from Bonnybrig' can wear their shell suits. All days of National importance such as today shall be declared public holidays! Womenfolk will be taught how to make shortbread and tablet! The Police will be able to issue on the spot fines if they hear English accents, however their fines will be rescinded if they can pronounce Ecclefechan, Ballachulish or Kirkcudbright! I have a vision, ladies and gentlemen and it's tartan! Will you join me in making my vision a reality......................? Ladies and Gentlemen, here’s to being Scottish!